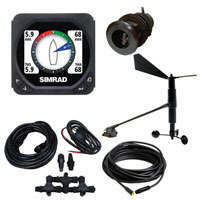 Click the button below to add the Simrad IS40 Speed-Depth-Wind Package to your wish list. When coupled with the intuitive OP10 autopilot controller and the necessary computers and drives, it can operate as a standalone autopilot or it can easily be integrated as part of a much larger electronics system. A tough, sunlight viewable screen, with clear digits and a display that's almost 40% larger than its rivals. Read wind, speed, depth, boat speed, heading, autopilot status, engine data and much more. Greater contrast for increased readability with a massive 170° viewing angle. Zero condensation ensures a clearly visible screen in all seasons providing outstanding longevity and durability. Enjoy an extremely bright display with the latest LCD technology, day or night. Large keys, a dedicated Page button and straightforward menus allow instant access to the data you require. Micro-C connectors provide for quick and easy connection – ideal for retrofit or new build. Compatible with industry standards. Choose a simple network and expand it to fit your requirements with full Simrad NSS and NSE chartplotter compatibility. Elegantly designed yet brutally strong.